Feed and Go Smart Pet Feeder is an extremely handy and reliable pet feeding device. 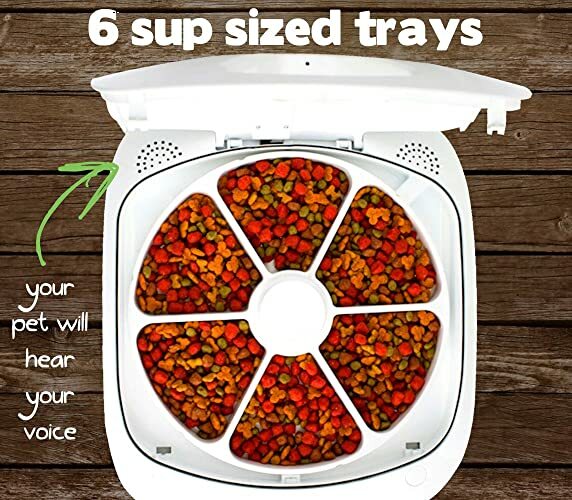 Pet lovers have designed this machine and it is one of the best automatic pet feeders for cats. You can feed your cat dry as well as wet food and even treats at any point of time. It has a built-in webcam where you can keep a check on your pet animal. The device comes with real-time notifications to tell you if your cat is eating properly or not. You can control feeding your cat from any smartphone including Android, iOS and Windows OS. This is the best machine that can give you a peace of mind when you are not at home with your pet. This automatic feeder for cats is a reliable, function and fun device for your pet. It can be a great friend and you can rely on the machine to feed your pet on time. This feeder is the only device that can support dry and wet food with treats and medications. There are six compartments that can hold up to eight oz cup of food. 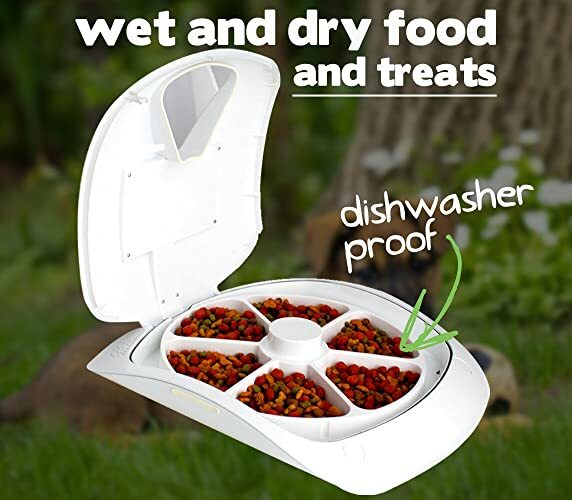 It measures 18L x 16W x 13H in inches and can store wet food up to twenty-four hours. The customer portal helps you to set your personal profile in a very short time. You can set up virtually unlimited regular or one-time feeding schedule for your pet. 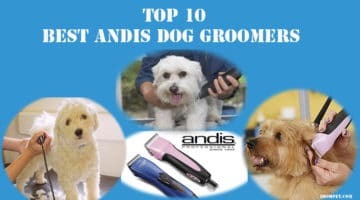 If you have more than one pet in your home, then this is the best device for you. You can control unlimited feeding from one profile with a simple button press. The Feed and Go Smart Pet Feeder can be set to provide real-time messages through Email or SMS. It will help you to know when your pet is hungry or it has eaten or both. This is one of the best automatic pet feeders for cats that have gone wireless as in internet wireless. You can easily connect the machine from anywhere in the world. All you need is to connect the device to the home Wi-Fi network and a smartphone by your side. It comes with a programmable timer that allows you to designate the amount of food for your pet. You can program the machine to dispense 3-5 meals a day. As a pet owner, you can customize portions and feed your pet according to their needs. The feeder also features a portion control system that can put your pet on a diet. Carefully unpack the automatic feeder for cats wet food from its packaging and ensure there are no cables plugged in the device. Connect the USB cable and plug into the power supply. Plug on the Power Jack that is located at the back of the unit. Insert the power plug into a wall socket. The Cloud LED and Network LED will flash a few times and then one button will flash slowly. Once the power is connected, the power led will start glowing. Place the machine within the reach of your Wi-Fi router all the time. Press the WPS button at the back of the device and it will connect to your Wi-Fi router. You will have to record a personal greeting that will play every time the machine dispenses food for your pet. After that, you will have to register the device and create a feeding schedule. Once the registration is completed, connect the device with your smartphone. You will now be able to control the feeder from any place in the world. It is important to feed the pets on time or else they will starve. This automatic feeder for cats delivers a great job in dispensing food at the right time. You can connect the device to the home Wi-Fi network and monitor feeding from your smartphone. The automatic feeder will give you notifications at regular intervals of time regarding the feeding of your pet. In this way, you will know whether your pet animal is eating or starving. A built-in camera is available that will help you see you pet eating the food. You can also call your pet from your mobile through the internet to do regular check-ins on them. There is a speaker on the feeder where you can talk with your animal. If you have been using an automatic feeder for years, you might be wondering why you need an online one. Feed and Go Smart Pet Feeder gives you the peace of mind and checks how much your pet has eaten. 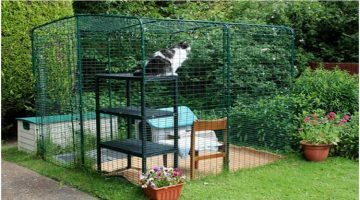 The device is one of the best automatic feeder for cats. It can help you go online and make changes to the feeding schedule. This is a great device for people who are busy professionals or those who travel a lot. It is the world’s first online feeder that matches your needs and delivers perfect solution. 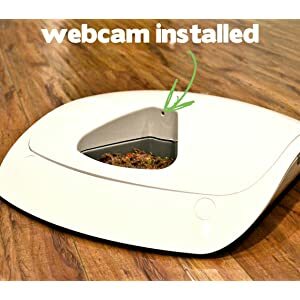 Now your pet will have the right amount of food and watch your pet anytime using the web camera. Just hook up the device with Wi-Fi router and you are ready to go. Let your pet feed using this dispensing device and make your life easier.